Picked up the May issue of Nintendo Power (vol. 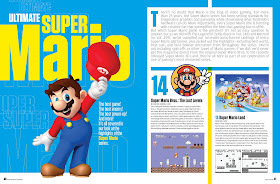 278) and beginning on page 60 is a feature dubbed Ultimate Super Mario. 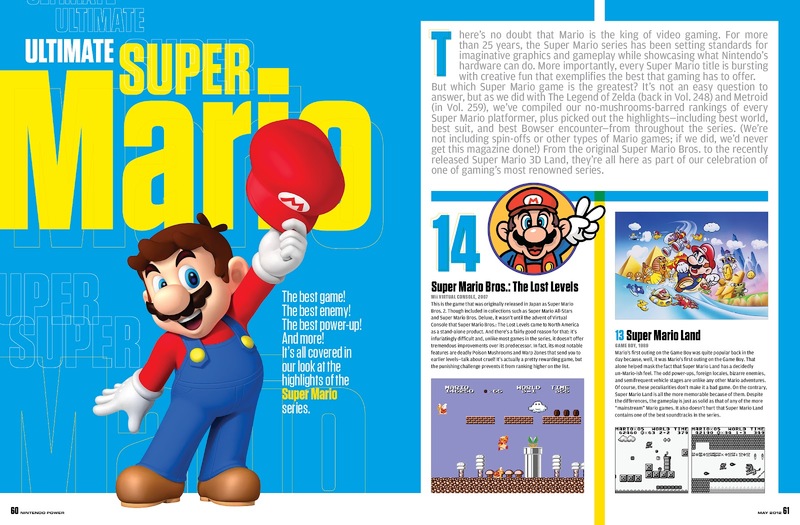 This 11 page feature picks fourteen titles from the Super Mario series and ranks them. Mario's has had outstanding platforming adventures both in the 2D and 3D so ranking them in order is no easy task. Yet they did anyway. I'm sure this list will present some upsets, but here it is, anyway. For good measure, I've even included their sidebar picks. What do I think? Well, Super Mario Bros: The Lost Levels has no business even being on the list as it's just a rom hack created by Satan. I won't argue Super Mario Galaxy ranking higher and Super Mario Galaxy 2 as I'm in the camp that actually likes the original over it's sequel. I don't think it's the best Super Mario game, though. I'd save that honor for Super Mario Bros. 3. The Mario Kart series is hands-down the best spin-off. Luigi as the better Mario brother? I agree and will always argue in Luigi's defense. The Hammer Suit is awesome and it better be in New Super Mario Bros. 2. I loved Rosalina and thought she was a great addition to the Mario universe. I actually enjoyed the bits of story we got from her in Super Mario Galaxy, which added more to the story than simply saving Peach. Heck, her inclusion in the game made me actually care about the story in a Mario platformer. Anyway, those are my thoughts. What about you? When I was a wee lad I held a controller in my hands and my life was forever changed. In addition to being a gaming fanatic, I'm a lover of art, cartoons and anime. Here, I share my appreciation for all of that.